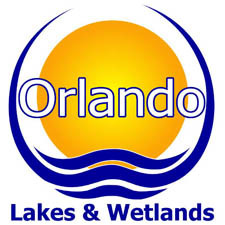 As part of its proactive approach, Orlando Lakes & Wetlands takes every opportunity to install aquatic plants within its lakes and waterways to improve aesthetic appeal (aquascaping) and in order to utilize the biological processes of the plants to help improve and regulate waterways. The process of using plants to remediate environmental substrates is called phytoremediation. The word comes from the Greek « phyto » = plant, and Latin « remedium » = restoring balance, or remediating. Phytoremediation is the de-pollution of contaminated soils, water or air with plants able to contain, degrade or eliminate metals, pesticides, solvents, explosives, crude oil and its derivatives, and various other contaminants, from the mediums that contain them. It is clean, efficient, inexpensive and non-environmentally disruptive, as opposed to processes that require excavation of soil. Phytoextraction - uptake and concentration of substances from the environment into the plant biomass. Phytostabilization - reducing the mobility of substances in the environment, for example by limiting the leaching of substances from the soil. Phytotransformation - chemical modification of environmental substances as a direct result of plant metabolism, often resulting in their inactivation, degradation (phytodegradation) or immobilization (phytostabilization). Phytostimulation - enhancement of soil microbial activity for the degradation of contaminants, typically by organisms that associate with roots. This process is also known as rhizosphere degradation. Phytovolatilization - removal of substances from soil or water with release into the air, sometimes as a result of phytotransformation to more volatile and / or less polluting substances. Rhizofiltration - filtering water through a mass of roots to remove toxic substances or excess nutrients. The pollutants remain absorbed in or adsorbed by the roots. The cost of phytoremediation is generally lower in the long run than traditional processes. The plants provide animal habitat. The plants beautify the waterway. The plants increase gas exchange between the waterway and atmosphere and subsequently increase dissolved oxygen levels. The plants can be easily monitored and maintained. The plants may help reduce the amount of chemicals necessary to keep waterways beautiful. Some of the plant species that Orlando Lakes & Wetlands recommends for Aquascaping/Phytoremediation (pictures and write ups courtesy of the Center for Aquatic and Invasive Plants, University of Florida, IFAS) are featured below. The native pickerelweed is a very common emersed plant. It is a prolific grower and can cover large areas. 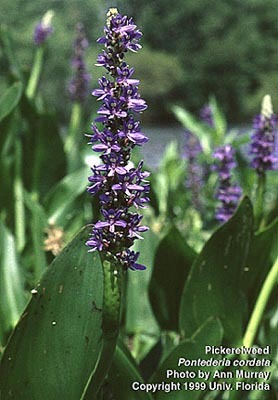 Pickerelweed typically grows to about two to three feet tall. Its leaves are large, up to five inches wide, and are usually twice as long. Leaf shapes are variable, but are usually lance-shaped. 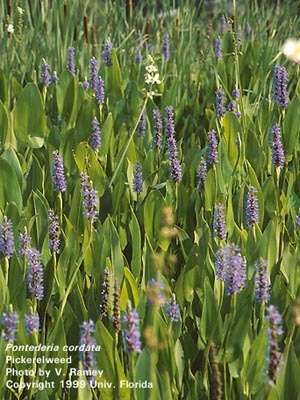 The easiest way to recognize pickerelweed is by its spike of violet-blue flowers. Sometimes the flowers are white. Duck potato is an emersed plant. It's large leaves and conspicuous flowers make it easy to find in the wild. 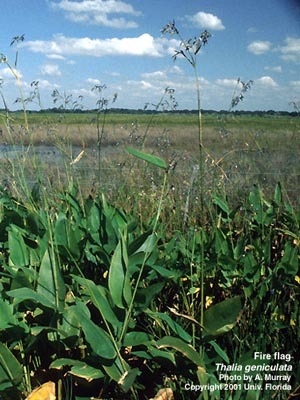 It grows commonly in swamps, ditches, lakes, and stream margins. Duck potato gets its name from its potato-like, underground corms that sometimes form. Duck potato has large, firm, lance-shaped leaves, which are typically four inches wide and up to two feet long. The leaf bases taper to the stem. The leaves grow as a fan-like rosette from underground rhizomes. 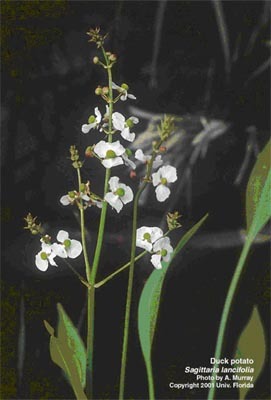 Duck potato flowers are typical sagittaria flowers: showy and white, with three petals. 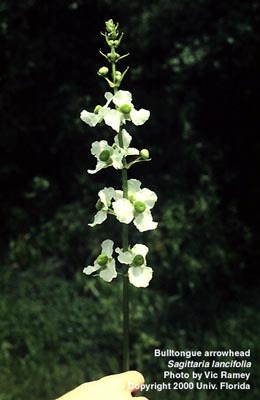 Flowers are extended on thick stalks that are often a foot or more above the leaves. Fire flag is a large emersed plant that grows from a thick rhizome. 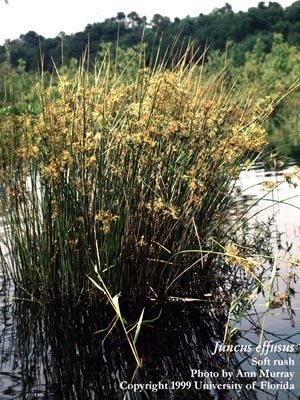 It grows in ponds, swamps, marshes, and along stream banks. It is not widely distributed. Large simple leaves on long stalks are among fire flag's most notable features. The leaves are broadly lance-shaped, with broadly rounded bases. They can be up to eight inches wide and more than 2 1/2 feet long. Several leaves growing together are sheathed at the base. Fire flag flowers are paired; that is, two flowering bracts emerge on top of a tall flower stalk. Multiple small purple flowers hang from the bracts. The flowers have three petals. 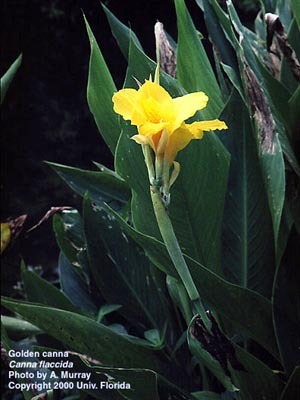 Canna is an emersed plant. It is a showy native which typically grows to four feet tall. It grows in small stands at the edges of marshes, ponds and lakes. It has been hybridized and may also be found in household gardens. 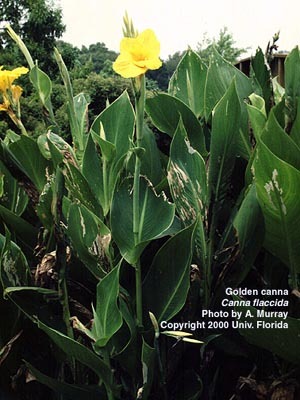 There are two species of Canna in Florida (Wunderlin, 1998). Golden canna occurs in AL, FL, GA, LA, MI, SC, and TX (Kartesz, 1999). Golden canna flowers are showy yellow. (Hybrid canna has flowers tinged with orange and red.) The three-inch-long flowers grow in clusters at the tops of long stalks. Golden canna leaves attach in a spiral along the stem. The leaf shape is oblong to elliptic, with tapering bases and pointed tips. Leaves may be six inches wide and two feet long. The fruit is a large three-part capsule that is rough to the touch. This cord grass might be encountered as very large clumps growing in extensive areas of fresh and saltwater marshes or even in pastures. Its long erect light-green leaves are almost completely rolled and tapered to sharp points making it look somewhat rush-like. Blue flag is an emersed plant. These elegant natives are medium size plants, growing to four feet tall. They grow from stout underground rhizomes, and occur in a variety of wetlands. 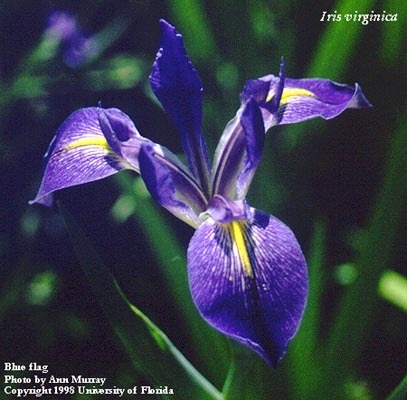 There are seven Iris species that occur in Florida (Wunderlin, 1998). Blue flag is prevalent throughout the eastern half of the U.S. and Canada (Kartesz, 1999). Blue flag's large flowers make it almost unmistakable. 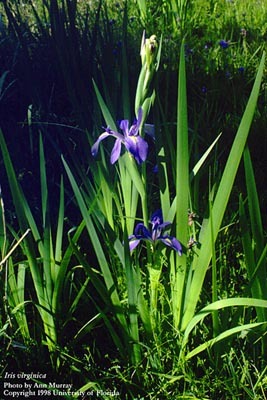 They are pale blue to purple flowers and are the only large irises growing wild in Florida. Their leaves are narrow and swordlike, and up to 2 1/2 feet long. The leaves are pointed and flattened. They arise fan-like from a single base. 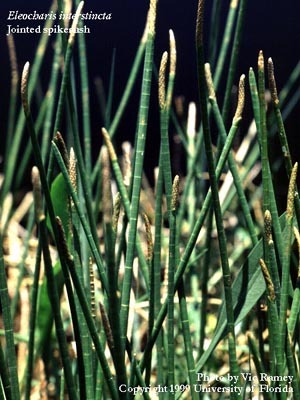 There are several native aquatic bulrushes in Florida, often found growing in large colonies in water. 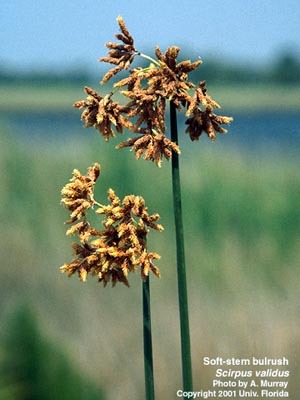 Bulrush seeds are eaten by many kinds of birds. 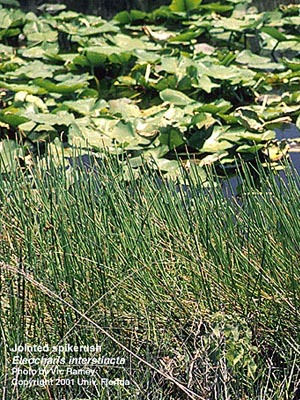 Bulrushes are often seen as tall, leafless stems growing in profusion, however there are several small and leafy bulrushes in Florida. Bulrushes are eaten by ducks and other wildlife. Bulrushes are bulrush sedges. 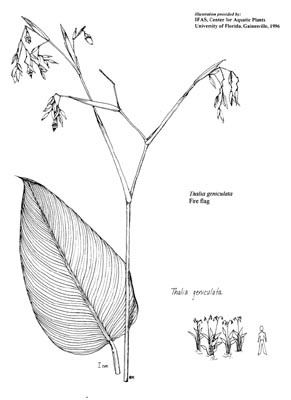 stems sharply- to softly-triangular; leaves in some species reduced to sheaths, in other species there are many obvious leaf blades; inflorescences always on stem tips, compound, much branched, tight cluster or spreading open; bracts sometimes leaf-like or sometimes resembling stems. 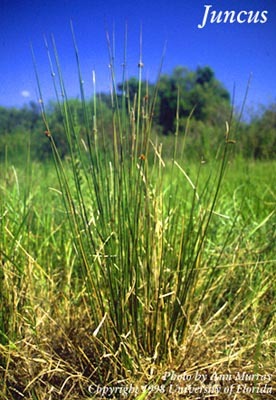 This is another large native clumping wetland grass, and is believed to be one of the dominant grassland plants of the southeast U.S. before human settlement. It has an atypical inflorescence that makes it easier to identify than most grassses, and which shows it to be closely related to corn. 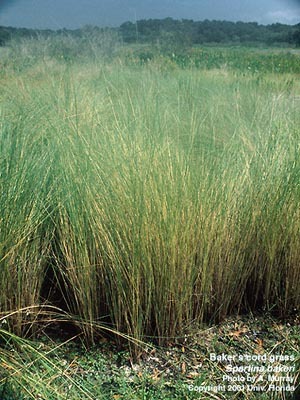 Eastern gama grass is sold in nurseries for home use. 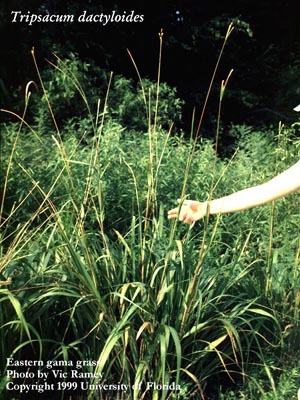 Eastern gama grass is a very large grass. stems clump-forming, to 6 ft. tall; leaf blades large, flat, smooth, to 2 1/2 ft. long, to 1 in. wide; sheaths smooth; inflorescences usually 2-3, narrow cylindrical, on stem tips, 4-11 in. long; spikelets single, embedded on opposite sides at each joint of axis. This is one of the largest Eleocharis species and may first be noticed as a patch of dark green stems growing in the water on the edge of a canal, having conspicuous light brown cylindrical spikes at the tips. This Eleocharis is one of 30 species that exist in Florida (Wunderlin, 1998). Jointed spikerush occurs in AL, FL, TX; and in PR and the Virgin Islands (Kartesz, 1999). Jointed spikerush is a rush. Stems erect, firm, round, 16-48 in. tall, to 1/2 in. across; conspicuous cross hatching (light green lines) at stem walls, closer nearer the top; leaf blades none, just sheaths; sheath thin, soft, red; inflorescence a single spikelet, about as wide as stem, at stem tip, cylindrical, long, to 2 in. long, scale tops very rounded; flowers many, whitish; nutlets rounded, surrounded by barbed bristles. 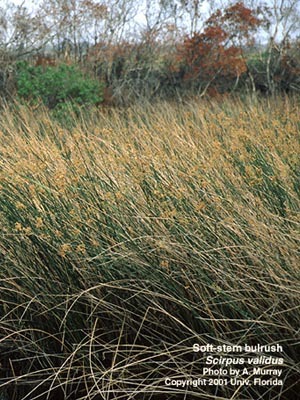 One of the most common species of Juncus, the native soft rush may be found as a single clump, as a colony of clumps or as a colony of single stems several feet tall, in water or on "dry" ground. It may be found in fresh- or saltwater wet areas. Soft rush provides food and nesting to birds and other wildlife. 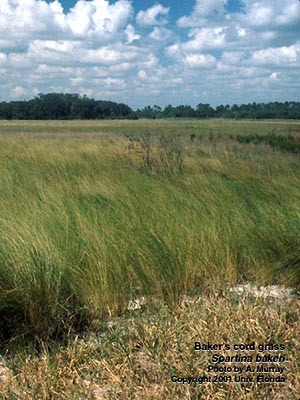 Twenty-one species of Juncus occurs in Florida (Wunderlin, 1998). Soft rush is located throughout the majority of the US, parts of Canada, and PR (Kartesz, 1999). Soft rush is a true rush. Its pale-green stems are erect and two to five feet tall. Stems are cylindrical and filled with pithy pith. Soft rush has no leaves. Leafy reddish sheaths wrap the stems at the bottom of the plant. The inflorescence of soft rush appears to be coming out of the side of the stem. The inflorescence is open and branched. Each branch has 30-100 small flowers, each greenish-brown flower on its own stalk. Above the inflorescence is a "continuation" of the pointed stem, this being a stiff, rolled and pointed bract, usually brown or grayish when mature. Spatterdock is a large plant whose leaves are often floating, however submersed and emersed leaves are common. 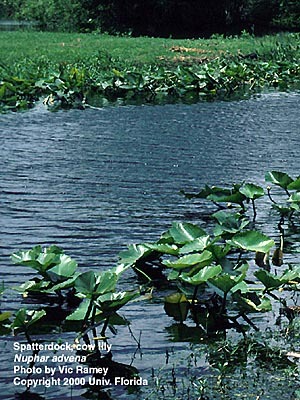 Spatterdock occurs in ponds, lakes and sluggish streams. Spatterdock has large heart-shaped leaves, usually with wavy margins. Spatterdock floating leaves are attached to long, stout stems which arise from large, spongy rhizomes. Spatterdock submersed leaves are very thin, attached at the bottom rhizomes. Spatterdock flowers are yellow and "half-opened" at or above the water surface. Flowers are attached to thick round stems that are often six feet long. 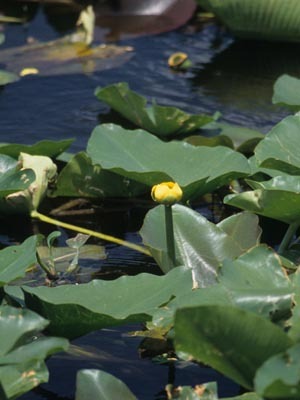 For many years southeastern (U.S.) flora have treated the genus Nuphar as a single species, Nuphar lutea, which was further divided into many subspecies. Recent studies, based on comparisons of morphological features and interpretations of molecular analysis, do not support the single species concept. In fact, results indicate the name Nuphar lutea should not be used for any North American Nuphar members. The genus Nuphar is now represented by eight distinct species in North America. A key to this new classification is provided in Chapter 12, Nymphaeacea by Wiersema and Hellquist, Vol 3, Flora of North America, 1997; and Volume 1, Aquatic and Wetland Plants of Northeastern North America, by G. Crow and B. Hellquist, 2000. 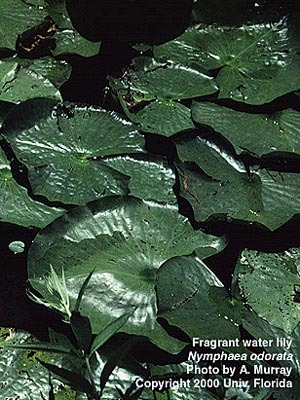 Spatterdock may be confused with water lily, Nymphaea species. Compare the leaf shapes and flowers. Swamp lily is an emersed plant that grows in wetlands and along streams. It is a fragrant native. There are three species of Crinum in Florida (Wunderlin, 1998). 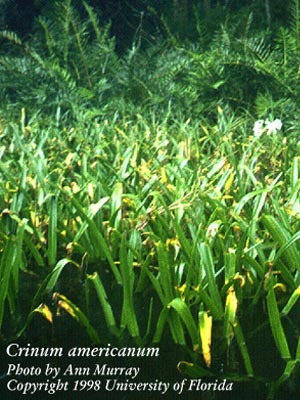 Swamp lily is found in the southeastern U.S. (Kartesz, 1999). 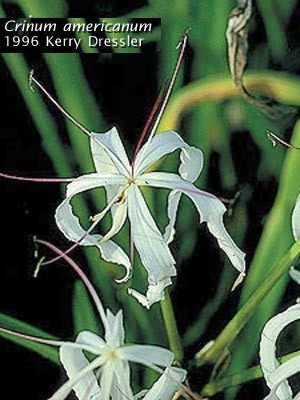 The swamp lily is a perennial herb with an onionlike bulb. The leaves are erect to spreading. Leaves are straplike, to three feet long. The leaves are to three inches wide. Swamp lily flowers arise from the bulb on a long flower stalk that is separate from the leaves. The flowers have six petals and are white or white and pink. Water lilies have floating leaves. There are about 40 species of water lily in the world, plus numerous hybrids and varieties. Some water lily species prefer southerly warmth and are found in temperate and semi-tropical zones, some prefer the cold and are found only in northern Canada and Alaska. This species, fragrant water lily (Nymphaea odorata), occurs from Puerto Rico to Alaska and from California to Quebec (Kartesz 1999). Its many subspecies and varieties may be found floating in ponds, lakes and sluggish streams just about everywhere in North America. Water lily leaves are nearly circular in shape. They are notched to the center. Its leaf lobes are pointed. The leaves arise on stalks from long rhizomes in the mud. 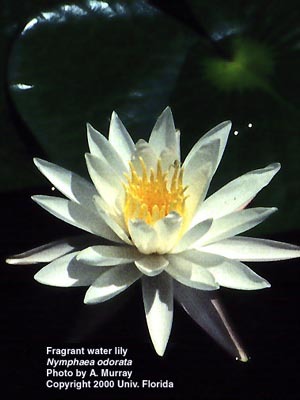 Fragrant water lily flowers are showy white and aromatic. Flowers of unusual color and shape are characteristic of hybrid water lilies.